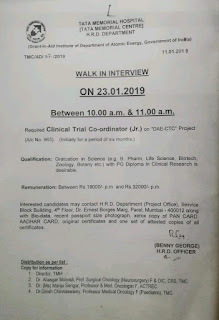 TATA Memorial Hospital Walk-In Interview for Freshers on 23rd Jan 2019 - Clinnovo! Clinnovo Offers Services & Training In Clinical Research Course, Clinical Data Management Training,SAS, SDTM, ADaM, Medical Coding, Imaging, Pharmacovigilance and Drug Regulatory Affairs. Online Clinical Course, Class Room, Pg Diploma, Internships Available. 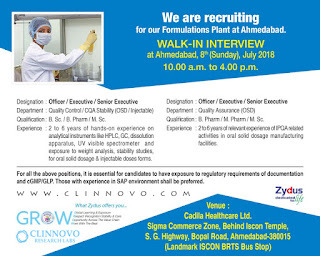 Accenture Hiring for B.Pharm / M.Pharm / Pharm.D Freshers - Clinnovo! 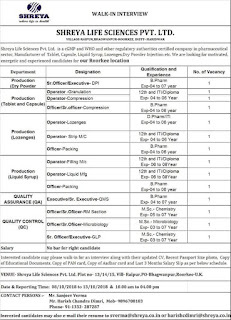 Shreya Life Sciences Pvt. Ltd urgent requirement for Multiple Positions on 8th to 13th Oct 2018 - Clinnovo!